Ginny was born in Birmingham and educated at schools in Birmingham and Malvern. She read Law at the University of Cambridge. In 1989 she was called to the Bar and practised criminal law in the Midlands until the birth of her daughter, when she become a stay at home mother. She would not call this giving up work. As Chairman of her children`s School PTA Ginny produced four successful revues, for which she wrote and performed sketches. One of these, “The Diary of Mrs Bridget Jones” forms the first scene of her first one-woman comedic play “Ten Days .. that shook the kitchen!” “Ten Days …!” was a sell-out over three weeks at the 2008 Edinburgh Fringe Festival and became the first of the six stand-alone plays which comprise “The Ruth Rich Saga”. (“Ten Days ..!”, “Family Matters”, “Double Booked”, “Something Fishy”, “Fashionably Late” and “UpDownSizing”.) Ginny now works full time writing and performing her own material. Further plays are “Hound Dog” 2013 (celebrating her importation of a harehound from Crete), “Learned Friends” 2015 (a courtroom drama. Winner “Best Original Piece” Birminghamfest 2016) and “Arrows of Desire” (a lighthearted comedy set in the context of a rural Women’s Institute). She performs throughout the UK in venues ranging from private sitting rooms to 300 seat theatres via school and village halls. Audiences have included members of the royal family, a pet labrador, a chicken and numerous mayors. She has performed at the Fringe Festivals in Edinburgh, Brighton, Buxton and Stratford upon Avon. In July 2009 she became a “plinther” and performed for one hour on the fourth plinth in Trafalgar Square as part of Antony Gormley’s “One And Other” project. In 2016 she took part in Spencer Tunik’s “Sea of Hull” art installation. She has performed in four training DVDs for the Judicial Studies Board and also writes short stories. 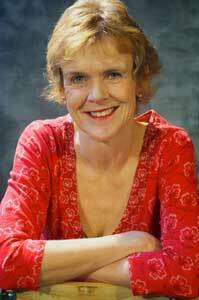 “Requiem” won the Oundle Festival of Literature Short Story Competition in 2008. “The Judge’s Clerk” and “The Tenancy” were shortlisted in the same competition in 2009 and 2010 respectively. Ginny`s children have achieved more acting fame and success than she ever will. Rosie (26) played Pip in The Archers (Radio 4) for three years. Ralph (23) is a professional actor who has performed at Shakespeare’s Globe Theatre and with the Royal Shakespeare Company. Her husband, Bill, is a High Court Judge. He has performed at The Loft Theatre, Leamington Spa and The Talisman Theatre, Kenilworth. His “Basil Fawlty” is something else. Blue Orange Theatre, Great Hampton St, Birmingham. The Central Criminal Court, Old Bailey, London. The Players Theatre, Nelson St, Thame, Oxon. Staveley Roundhouse, Main St, Staveley, Cumbria . Queen Elizabeth II Law Courts, 1 Newton St, Birmingham B4 7EH.